When it comes to divorce, it seems like everyone has advice. People come out of the woodwork to offer up their two cents, whether you ask for it or not. One piece of guidance frequently shared is that you should file for divorce first. But the question remains: is this sound counsel or does it do more harm than good? Like with most legal matters, the answer isn’t black and white. There’s no one-size-fits-all solution that works in every scenario. Each situation has its own unique set of variables, and what’s ideal in one case may be disastrous in another. Still, whether or not to file for divorce first is a question worth considering. Some believe that if you file for divorce first you place yourself in an advantageous position. With all the strategy and jockeying that goes into the process, it may sound reasonable to get any possible edge. In some cases, it may well be the right choice. But not always. 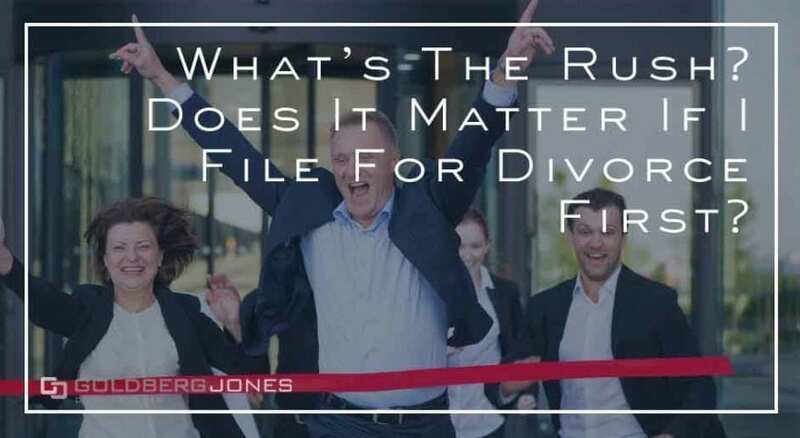 While the spouse who files for divorce first does get the ball rolling, that doesn’t always give you the lead. Each option comes with its own positives and negatives. Perhaps the biggest advantage when you file for divorce first is that it gives you time to prepare. If you’re considering divorce, chances are that you noticed your marriage is in rough seas. Still, if your spouse kicks off the process, it often comes as quite a shock. If you file for divorce first, you avoid potential surprises. You won’t be blindsided or have to scramble to play catch up. It allows you the time and space to get all of your affairs in order. While it’s possible to handle a divorce on your own(called pro se divorce), in most situations, it’s in your best interest to hire a divorce lawyer. Perhaps you have a lot of shared assets to divide. In that case, maybe you need a financial expert’s assistance. Whatever your needs, if you file for divorce first, you have the opportunity to assemble your team ahead of time. From tax records to legal paperwork, a variety of documents figure into divorce. Again, this gives you the chance to collect and organize in advance. Since divorce tends to be rather pricey, you can save and make sure you can cover attorney fees, charges for filing paperwork, court costs, and any other expenses that arise. And there are always costs you don’t see coming. Depending on your situation, getting the drop may even prevent your spouse from attempting to hide assets or other shady doings. Hopefully, you don’t have to deal with that, but it happens. Laws about divorce, division of property, and child custody vary a great deal from state to state, sometimes even county to county. As such, jurisdiction often plays a big role in the ultimate outcome. When you file for divorce first, you have more power over where jurisdiction falls. If you and your spouse live in the same place, the effect of filing for divorce first probably won’t have a substantial impact. But if you live in different cities, counties, or states, that’s a different story. One area that may benefit from this is the division of property. The difference in this realm swings wildly depending on where you live. For instance, Washington is a community property state. This means the court views all assets acquired during a marriage as belonging equally to both parties. You divide property differently under these statutes than in a state that practices equitable distribution, like Oregon and many others. Jurisdiction also figures into child custody, and the presence of children drastically impacts jurisdiction. Thanks to the Uniform Child Custody Jurisdiction Act and similar measures, authority in custody cases relies more on the best interests of the child than where you reside. So, if kids factor in, when and where you file for divorce first may not carry the same weight as in other cases. If you file for divorce first, you may get the chance to present your side of the argument first. While that sounds good on paper and can have advantages, it’s not always ideal. Presenting your case before your spouse provides the opportunity to make a strong initial impression. Judges are human, and being the first person before the bench can have a lasting effect. Though if you get off on the wrong foot, a strong first impression may be detrimental. On the other side, going first shows your cards. You tip your hand and unveil your strategy to the opposition. Whatever you work on with your divorce lawyer, that’s all out in the open, and your ex and her counsel have the chance to react and tailor their response. Ideally, however, revealing your plan shouldn’t be a huge problem. If you build a strategy on a sound legal foundation rather than artifice, stunts, and emotion, you should be fine. If you have a strong case, when you present probably won’t be an issue. Considering all of this, it’s time for the big question: should you file for divorce first? It’s a complicated proposition with no simple answer. No two situations are ever the same, and depending on the specifics, being the first out of the gate can be positive, negative, or relatively neutral. Sometimes taking an aggressive, confident approach benefits your case. But if you haven’t laid the proper groundwork to support yourself, it probably isn’t the ideal choice. If you have a plan and a strategy and are ready to go, by all means, file for divorce first. That said, don’t file for divorce first just to be the one who lights the fuse. Being prepared is the most important part, and if you’re not ready, ease up on the gas. Take the time to organize and build a strong case. Get all of your paperwork and documents together and in order. Hire a divorce lawyer if you need one. Put in the time and legwork to determine what your case requires and take care of those concerns. Once you handle all of the details, then you can file for divorce. From the court’s perspective, it doesn’t really matter who initiates the process. So long as you have a strong case and come well prepared, you have a chance at an optimal outcome no matter who was fastest out of the blocks.